Six days of mixed LSK price movements and price action is still held within a $1.1 range defined by $6.3 and $4.2 high-low of 24.10.2017. The 20 period MA acts as our immediate resistance after that break below on 28.10.2017. 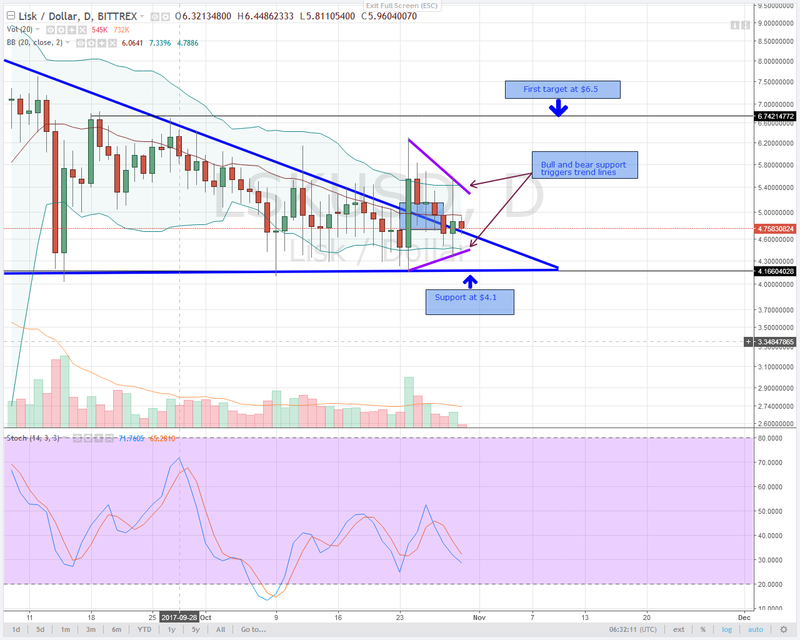 Any LSK close above $4.7 will mean LSK bulls resurgence. However, from the look of things, the constant lower lows after 24.10.2017 resulting in that falling three methods and yesterday’s $1.4 range long legged doji meant LSK prices are still within a BB squeeze in an horizontal consolidation. Break and close the lower $4.1 base line of this triangle means USD bulls and a trigger for LSKUSD sells. 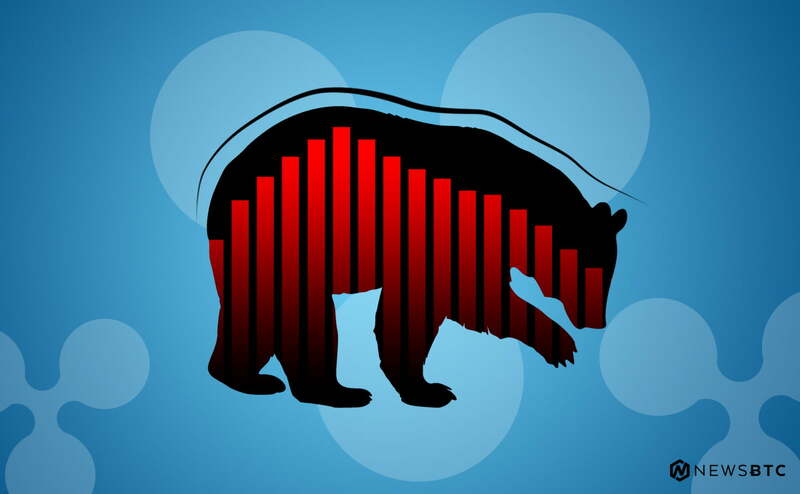 For now, our bull and bear triggers are above $5.5 and $4 respectively. No clear trend and so I urge traders to stay on the side lines until our triggers are filled. After 24.10.2017 fake bull break out, IOTA price action have since recoiled lower. The $0.05 bear range is what has been consistent over the 6 trading days. This bear soldiers wiped $0.11 from IOTA after highs of $0.51. A stochastic sell signal with diverging %d and %k means sell momentum is high. Our IOTA triggers will only come to pass if IOTA bulls push for a close above $0.50. Furthermore, yesterday’s doji candlestick with above average volume sticking out in a bear trend hints of IOTA bull pressure. Since IOTAUSD is oscillating within our triggers, we shall wait until there is a clear break out before initiating our positions. After 22.10.2017 candlestick close, DASH price action closed below the lower BB meaning price was overextended. Since then, we have seen, despite these crazy whipsaws how prices have been moving higher relative to the lower BB. 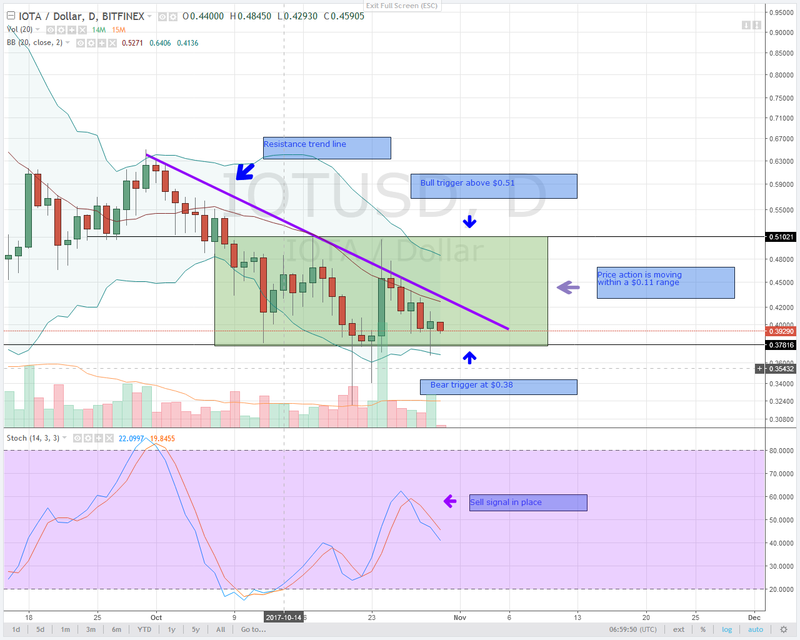 As a matter of fact, we can see DASH prices retesting $250 support. However, they consistently close within the BB . 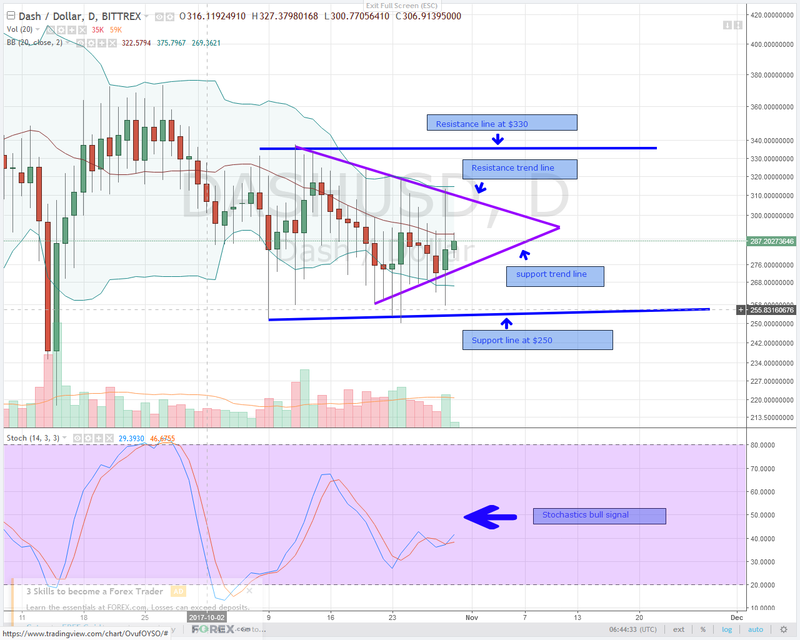 DASH prices are also closing higher and supporting stochastics buy momentum which is now turning higher after yesterday’s DASH bull candlestick supported by above average volumes. There is a buy signal in place. For conservative traders, a break above 20 period Ma and $310 resistance trend line will only guarantee a safe DASH bull entry. As mentioned on Saturday, Monero is clearly in a consolidation and oscillating within a BB squeeze which begun on 30.09.2017. From 18.10.2017, the middle BB has been a reliable resistance line with price action failing to close $90. So, with a buy stochastic signal in place turning from oversold territory with yesterday’s increased volatility-Monero moved $16-resulting in a bull candlestick forming at support line. 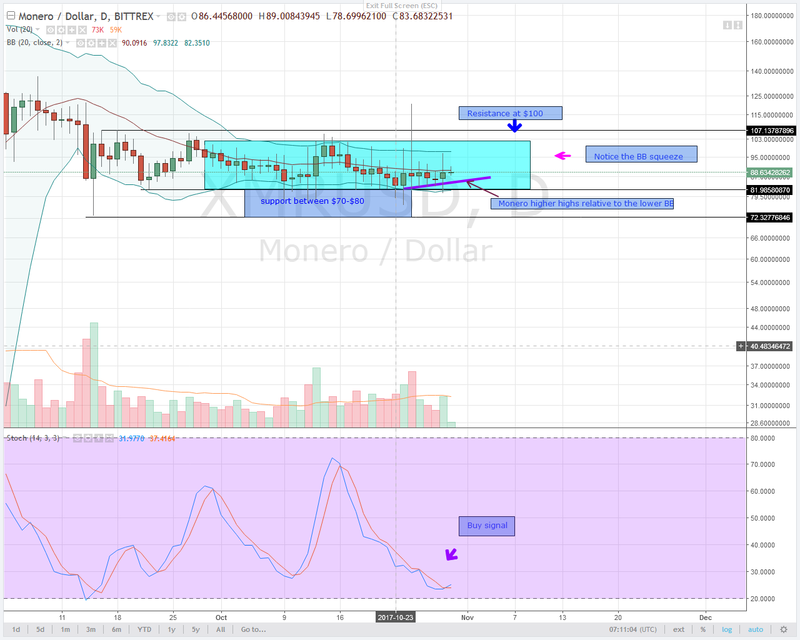 Also notice those series of Monero higher highs relative to the lower BB. If anything, I’m of the opinion that Monero prices will appreciate in the coming trading days. I recommend for buys especially if there is a close above $90 today. 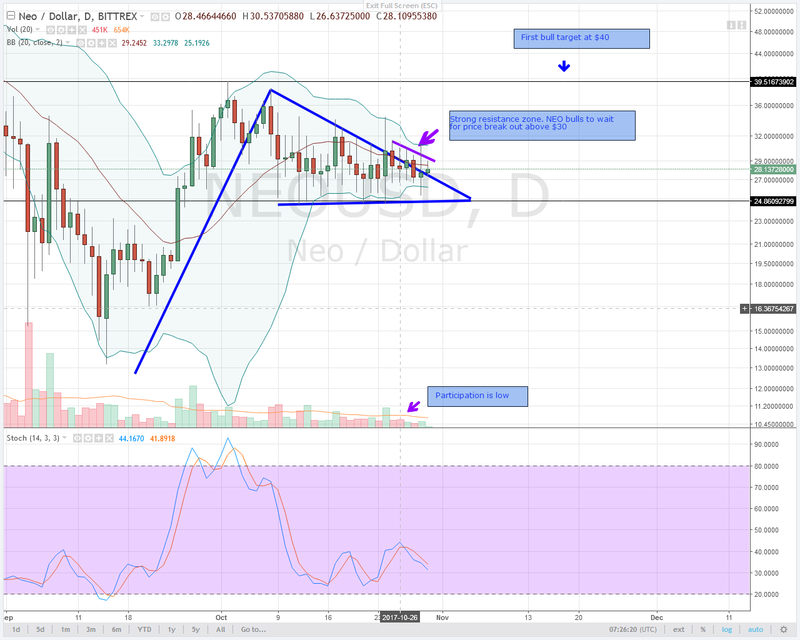 NEOUSD is trending higher with a stochastic sell signal and lower volumes. Well, because of these two reasons, we cannot really say that this NEO appreciation is strong. For NEO bulls to be in charge, a strong break out above this resistance zone above $30 is necessary. This means a strong bullish engulfing candlestick breaking above the 20 period MA and the minor resistance trend line. Until then, we take a wait and see approach.